Great news for the Reading Revolution – the Social Business Trust is investing £280,000 in The Reader Organisation, helping us to reach even more people through shared reading and combat social isolation through great literature. The Social Business Trust (SBT) was formed in 2010, offering expertise and advice to social enterprises who want to grow and scale up their operations, alongside financial investment. Looking at a social enterprise, SBT assess the obstacles facing the organisation and establish the best possible support from their partners, managing investment and links between enterprises and supporters. SBT’s investment in The Reader Organisation is its eighth investment in a social enterprise – others have included The Challenge Network, the London Early Years Foundation and the Shakespeare Schools Festival – and will be made up of a £100,000 cash grant and £180,000 worth of professional support from SBT’s corporate partners. The professional support package, led by British Gas with support from SBT’s other corporate partners, will underpin our growth and business development, defining development strategy and recruiting new positions. SBT’s investment will be vital in ensuring that Get Into Reading goes from strength to strength, reaching more of the people who most need the benefits that come from sharing great literature with good company. Currently, over 350 groups reach hundreds of people each week, bringing positive impacts such as self-esteem, boosted confidence and reduced social isolation. 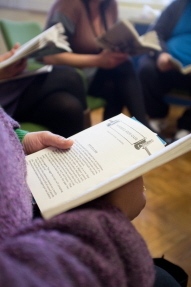 With the investment we can go some way towards achieving the ambition of delivering 1,920 weekly reading groups within five years and engage over 17,000 individuals, bringing closer our vision of providing access to shared reading groups to everybody in the UK. SBT’s partners are: Bain & Company, British Gas, Clifford Chance, Credit-Suisse, Ernst & Young, Permira and Thomson Reuters. For more information about SBT, visit the Social Business Trust website.